Hey guys, so today’s post is going to be a little different. I’m going to get a little personal with you. This past week was insane. So insane that I’m writing this just minutes before it will be going up. 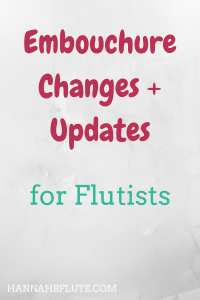 Amongst those changes was a revelation about my embouchure. I have a Cupid’s bow, and that means that I can’t get the best sound by playing exactly in the middle. So what exactly happened this week? Read on. Last Wednesday, I had a lesson with my flute teacher, and she noticed that I actually don’t play off to the side that much. I play a little off to the side, because the exact center would split my air stream. But I don’t play so far off to the side. My lip muscles aren’t “built” to play like that. So instead of concentrating on playing off to the side, I will now be concentrating on keeping my flute level. No more “flute drop disease” as my professor in undergrad called it. My arms are sure gonna get a workout from this. If you don’t already know, I have a full time day job as a bank teller. I started the job back in September, and before that I had a part time job as a cashier. I’ve been working almost nonstop for a year now. And finally, this week is my one week of vacation. Yes, aside from holidays, I have worked five days a week for the past (almost) 11 months. I am ready for a break. And my vacation couldn’t have come at a better time. A lot of craziness happened at the bank last week, some good, some not so good. But all I can say is that this past week makes my vacation that much more worth it. The main reason I even scheduled this week as my vacation week was because of NFA Orlando! So while I don’t fly out until Wednesday, I get the whole week off (banking procedures dictate a full week of vacation must be taken). So over the next couple of days, I will be packing and practicing in preparation for my first solo trip. It’s a little scary, but I know it will be a good experience for me. So if you see me, say hi! I will be staying at the convention hotel, and I will also be bringing my own food. Yesterday, I went food shopping and found lots of easy, filling, space-saving snacks. In fact, I might just make a video of what I got (follow me on Instagram to see). Applications that is! I have been working on audition material for the past few months, and I have narrowed my choices to about three schools. And last week, I officially applied to my alma mater. And actually, grad school might be a little closer than I thought, because I decided to apply for spring 2019 entry instead of fall. Online classes, anyone? Within the next couple of months, I will apply to a couple of other schools, but this week, I will actually (attempt to) earn some graduate credit. If you didn’t know, the NFA offers graduate and continuing education credit through a college called Seattle Pacific University. So for those of you already in graduate school or those applying, consider trying to get some credit while attending the convention! Sorry for the shorter post. As you might be able to tell, this week was crazy. But I managed to get this post up for you guys! If you are going to the convention, feel free to say hi if you see me. And, are you going to earn some graduate credit this week? Let me know down in the comments!